To get a taste of Bahia, try making this classic dish. Let us know how it turned out. 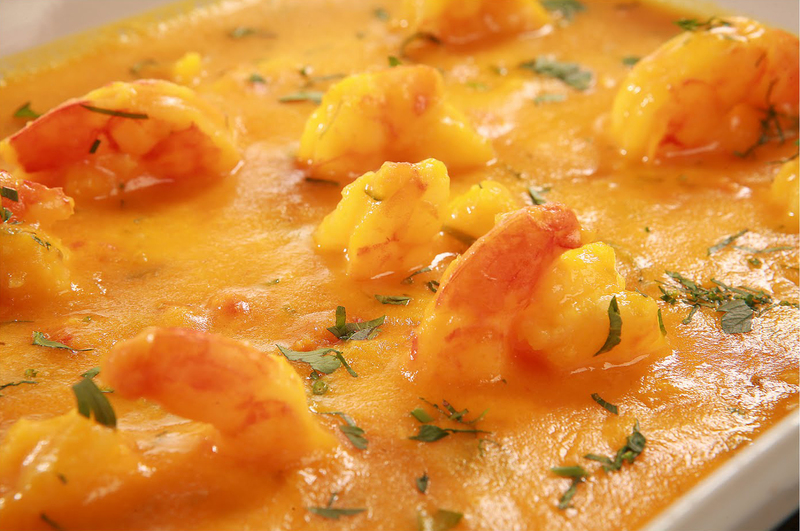 Bobó de camarão, translated as shrimp bobó in English, is a Brazilian dish of shrimp, puréed manioc (a.k.a. cassava or yuca), coconut milk, and other ingredients. Like many Bahian dishes, it is flavored with palm oil, called dendê in Brazilian Portuguese, and is traditionally served with white rice, but may also be served by itself. Bobó de camarão is nearly identical to the West African dish Ipetê, and is one of the many iconic recipes from the Bahia region. Prepare the manioc purée: In a large heavy saucepan, combine the onion, tomatoes, green pepper and cilantro with the mashed manioc. Stir in the olive oil and coconut milk, then heat over medium-high heat, stirring constantly. Cook for 10 minutes, stirring constantly, or until the cream begins to pull away from the bottom of the pan when you stir. Remove from the heat and reserve.